The myth of the founding of Mantova is part of the rich tapestry of Graeco-Roman mythology. It begins with the story of the prophetess Manto, daughter of the Theban seer Tiresias. Greek sources tell that Manto, escaping from Thebes, arrived, after many wanderings, in the territory of today’s city, which was then a swamp. In this place she created a lake with her tears; according to legend these waters had the magical property of conferring prophetic powers to anyone who drank of them. Eventually Manto met and married the river god Tybris (Tiber), king of the Tuscans, and their offspring Ocno eventually founded a city on the shores of the Mincio river, naming it Mantova in honor of his mother. Another historical and cultural gem is the Lombard city of Mantova, former home of the Dukes of Gonzaga. This amazing family ruled Mantova for nearly 400 years, and contributed at least one Saint, a couple of Holy Roman Empresses, several French Dukes, and a Polish Queen Consort. During the Renaissance the Gonzaga were among the most important patrons of the arts in Italy, including opera and music in general. The legacy of the Dukes of Mantova is most apparent today in the Palazzo Ducale, an architectural complex comprising several buildings connected by various corridors and galleries, and including internal gardens and courtyards. In the Palazzo Ducale one finds the famous Camera degli Sposi (Chamber of the Newlyweds), with frescoes by Andrea Mantegna, dedicated to Ludovico Gonzaga and to his wife Barbara of Brandenburg. 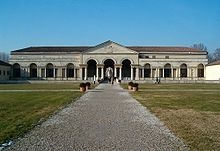 Another must-see in Mantova is Palazzo Te, designed by Giulio Romano in 1525 at the behest of Federico II Gonzaga. This palace, home to Federico’s “official” lover Isabella Boschetti, was built on a small wooded island in the midst of a lake since vanished. It contains the famous Sala dei Giganti, the Sala di Amore and Psyche, and the Sala dei Cavalli (the Gonzaga horse stables were famous all over Europe at that time.) Of course the city contains many more buildings of note, both secular and religious (more about Mantova) The immense Piazza Sordello, bounded on one side by the Palazzo Ducale, is the center of the old city, reached immediately by crossing one of the bridges spanning the Mincio. Palazzo Te is at the other end of the city, presumably to keep wife and official lover as far apart as possible. Naples’ artistic and cultural patrimony dates back two millennia, but there IS a vibrant, young Naples of music and spectacle awaiting the adventurous visitor. A place of modern entertainment, where various types of contemporary music can be enjoyed, is Galleria 19 (read: Galleria Diciannove), which is located on via San Sebastiano, in Naples’ historical center, very close to Via dei Tribunali. As glossy and hip as any equivalent establishment in the Haight or in SoHo, Galleria 19 offers disco, contemporary pop, jazz, instrumental and vocal, often with local musicians and singers performing live. The locale, reached by going down a few steps from street level, is a remodeled old book repository, long and narrow, with the stage at the far end and a hypermodern bar along the left side. Comfortable chairs and love seats are strewn along the right side, leaving a center space for dancing. Want to rearrange the furniture to suit your group’s seating preferences? By all means forget stuffy american rules and redecorate: this is free-form Naples, where rules are kept to a minimum. The ambience is a suggestive, atmospheric blend of severe ancient walls wearing the latest fashion in art and lighting. Most of the clientele, young people in their twenties and early thirties, are there in their evening best. Nowhere else in all of Naples will you see such expanses of long, stockinged female legs, ending in feet encased in pumps sporting 8-centimeter stiletto heels. As for the quintessential little black dress, this is the place to show it off, and they are little indeed. The young men do their best to keep up, in their form-fitting short coats and pants from Fusco. Definitely a feast for the eyes. Of Roman origins, lying in the foothills of the Apennines, Faenza is a splendid city of art that acquired fame in the Renaissance period for the production of exquisitely made pottery which was exported all over Europe. The very name has become synonymous with ceramics (majolica) in various languages among which French (faïence) and English (faience). From the second half of the first century A. D. the city developed as an independent commune (with inevitable ups and downs), reaching the peak of its splendor under Carlo II Manfredi, in the second half of the 15th century. Subsequently, after a brief period of Venetian rule, Faenza became part of the Papal States until 1797. 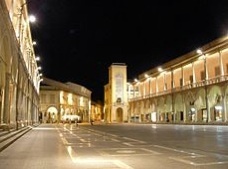 Faenza’s outstanding architectural attractions are concentrated in the two contiguous main squares: Piazza del Popolo, lined by two spectacular porticoed wings, and Piazza della Libertà. The Palazzo del Podestà and the Town Hall, both of medieval origin, stand in Piazza del Popolo. Along the east side of Piazza della Libertà one finds the splendid Cathedral. Of clear Tuscan influence, it is one of the highest expressions of Renaissance art in Romagna. Built to Giuliano da Maiano’s design, it was begun in 1474 and completed in 1511. Opposite the Cathedral the open gallery known as the Goldsmith’s Portico, built in the first decade of the 17th century, and the monumental fountain whose bronzes date to the same period, attract the eye. The Clock Tower, in front of the entrance to the Piazza, is a postwar rebuilding of the 17th century tower that stood at the crossroad of the cardo and the decuman gate of the Roman Faventia. Naples wears its urban dysfunctions as a disguise, a perverse diversion from the underlying substance, a challenge to anyone who wishes to know her. Like some women who are defined “high maintenance”, she requires infinite care and understanding, and forgiveness for a multitude of caprices and unreasonable demands. Willfully and maliciously, she flaunts her impossible congestion, her periodic sanitary crises, the hauteur of her people, the casual haphazardness of her services, her refusal to yield to the demands of modernity, as a gauntlet to filter out the faint of heart. Only the strong need apply, but the rewards for those who possess the necessary patience and fortitude are great. The treasures of Naples are endless. I know the city, and yet in the course of three days there we found things new and undreamed of. One of these is Napoli Sotterranea, the subterranean city above which the modern city is built. This consists of an extensive network of underground passages, caverns and cisterns, whose deepest recesses date back to pre-Christian Greek times. Above the Greek layer one finds structures dating from Roman times, and above these one finds medieval walls and artifacts. 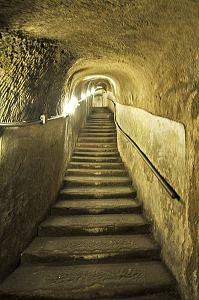 The underground city exists for several reasons: first of all, in constructing their buildings, Neapolitans simply used the surrounding tufa, the volcanic rock ubiquitous in the region. So, as a palace or a church went up, a hole was created by the quarrying of the building material. A key use for this growing network of underground passages, then, since ancient times, was the storage of water for the city. The water came from springs in the Apennine mountains, according to the ancient techniques of the Romans, who were able to build long aqueducts without pumps. Amazingly, this water collection and delivery system persisted into the 19th century, when, because of contamination from seeping sewage, it was abandoned in favor of the current hydraulic system. No hesitations this time, no halfway measures, no roundabout routes. Straight to Naples, Capodichino airport, from Spokane, Washington. Late morning arrival, zero problems, caffé and sfogliatella first order of business. Hot, but it’s the humidity that gets to you, 80 degrees in Naples is not at all like 80 degrees in San Francisco. It is a Friday. Message from my cousin Mimmo. We’re vacationing in Palinuro (which I already knew), come join us for the weekend, we have reserved a bungalow for you right next to our villa. We have no plans, no appointments, no internet, no house, no car. It’s a rare state of Nirvana. We have our telefonini and some dollars. Change some of those right away, switch to the vertiginously expensive euro. TIP: it’s always better to change to a currency in that currency’s home country. So, what can I tell you about Palinuro, the ancient mariner? Well, let’s don’t talk about the ancient mariner, go to Wikipedia if you are interested, there IS a story. Let’s instead talk about the little town which is named after him. First of all, you can travel from Naples to Palinuro for free. Or maybe it just happens on Fridays. Be that as it may, we did honestly try to buy train tickets, but time was short and the lines were long and the ticket machines didn’t work. So we got on the train ticketless, resigned to paying the fine when the conductor came. But lo!, no conductor in sight for the entire 2-plus-hour trip, hence the proverbial free ride. And did I mention the free entertainment? Opposite us there sat a gentleman who would not stop obsessing about the train’s punctuality. On a little piece of paper he noted the arrival and departure times at each station, kept a tally of the number of seconds we were early or late, and a running (mono/dia)logue on the train’s performance. After the fourth stop it was all I could do to keep from ripping pen and paper from his fingers and tossing both out of the window! So, here’s a question: how does one get to Italy by the fastest and most economical route? Answer, one drives from one’s home on the Peninsula to San Diego on a Friday, drives back to the Peninsula the following Monday, pauses three days, then drives to Spokane, Washington. 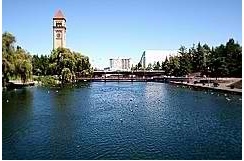 After five days in Spokane he boards a flight from Spokane to Seattle, a second flight from Seattle to New York, and a third from New York to Naples (not Florida, Italy!) Then he rides a train or a car from Naples to Rome, and voila, e’ arrivato! I kid you not, friends, Romans and countrymen, this is the odyssey, or calvary, depending on your point of view. And I will spare you the details of the trasloco from hell. For there’s beauty, justice and righteousness in this chain of events, as I will explain below. One goes to visit foreign cultures in part to experience and savor the differences relative to one’s own. In a sense, the starker the differences the more rewarding the visit to foreign parts. But what is the culture we have in the Bay Area? Multiethnic, multilingual, admixtures of Asian elements, European, South American, etc. etc. Everything is diffuse, boundaries are fuzzy, hybrid customs proliferate, cultural transitions become matter-of-fact and ordinary. Transitioning from such an environment to a foreign milieu is inevitably a gentle and gradual process for a traveler already cushioned against cultural shock by years of exposure to foreign customs and practices. 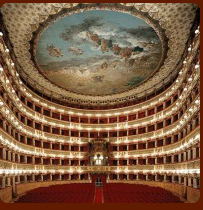 Naples’ San Carlo Theater is the oldest operating theater in Europe. Built in 1737, it has never missed an operatic season except in the period from May 1874 to December 1876, when, because of a severe economic crisis, financial support disappeared. The San Carlo was built by King Charles of Bourbon, son of Philip of Spain and Elisabetta Farnese of Parma. Charles gave rise to a dynasty which quickly shed all vestiges of Spanish influence and became, to all effects, an indigenous dynasty which endured through the turbulent Napoleonic period and came to an end only with the unification of Italy in 1861. Naples, as the capital of the Kingdom of the Two Sicilies (so-called for historical reasons), was, during the early Bourbon period, one of the most populous, beautiful, and cultured cities in Europe. The construction of the Teatro San Carlo was only one aspect of a general urban renovation whose purpose was to give Naples a physical appearance in line with the dignity and the prestige of the capital of a great kingdom. Within the scope of this general plan, the San Carlo was conceived as a fitting symbol of the royal power and of the dynasty’s support of the musical arts, a passion long inbred in the depths of the Neapolitan psyche. 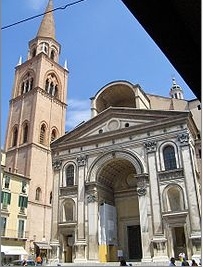 The San Carlo replaced the old (1621) and small Teatro San Bartolomeo, which was eventually made into a church. 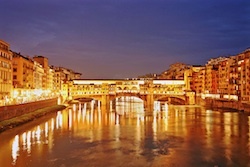 Starting in the spring of 2012, the Istituto Educazione Italiana will begin offering guided tours to Italy of approximately two-weeks duration. The tours will concentrate on history, art and culture, as well as gastronomy and leisure. The tours are organized by Mario Fusco and Angelica di Chiara, both natives of Italy and knowledgeable of the language and culture of the country. By using their extensive network of contacts in Italy Mario and Angelica are able to offer uniquely customized tours not available from commercial organizations. Mario and Angelica accompany each tour and provide value added in the form of language instruction, historical narrative, insights in the art and culture, and personalized interactions with “real” Italians in Italy. And of course they will deal with any unforeseen circumstances that might arise while traveling. The personal approach makes it also possible to contain costs and to offer significant value for the traveler’s money. The first tour if offered in May-June 2012. Please go to the Italian Tours page for details. Bologna is without a doubt one of the most underrated cities in Italy. The capital of Emilia-Romagna, it is a city of about 1/3 million people, with ancient roots in pre-Roman Etruscan culture, a rich artistic heritage, a well-preserved historical center, and a coherent integration of the best that Italy has to offer in art, cuisine, architecture, and lifestyle. With a long tradition as a university city, probably the first in Europe, it is enlivened by the cultural and social contributions of young people who come from all over the world to study there. It is famous for its towers, its portici, and its centro storico, among the best-kept in Italy following a careful policy of preservation and restauration. Bologna has long enjoyed one of the most efficient and dedicated city administrations in all of Italy, and this is reflected in the efficiency of its services, the care with which the physical environment is maintained, and the smooth functioning of its civic institutions. The relative obscurity of the city (compared to Florence and Venice, say), is perhaps due to the lack of an overarching artistic or architectural masterpiece to serve as a magnet for the attention of tourists and art aficionados, such as the David in Florence or the Sistine Chapel in Rome. And in fact the artistic importance of Bologna is due primarily to an homogeneous aggregation of first-class architectural and artistic masterpieces out of which it would be difficult to single out a distinct work for special recognition.